So, I recently started a book series and then ended up finishing it all in one week. It included a lot of late nights and completing chapters during nap time, but seriously...I couldn't put the books down! 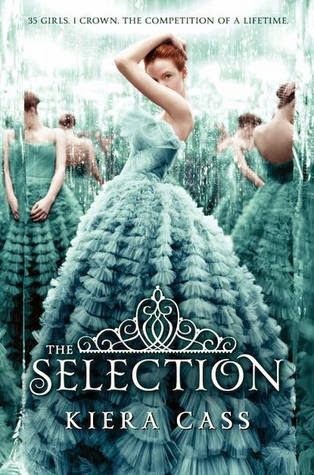 I'm talking about the The Selection series, a trilogy of "dystopian romance" books that have been pitched as The Hunger Games meets The Bachelor (some of you may already be rolling your eyes, I know). Via Amazon- "In a world where everything is determined by social castes, America was born a five, one of the lowest castes. This year, a Selection will be held to find a bride for Prince Maxon. America's mother thinks that having her daughter participate will be the solution to all of their problems but America doesn't want to participate for one simple reason - she is secretly in love with Aspen." I'll stop there to avoid giving anything away, but after finishing the third book I almost felt like maybe I should keep them as my dirty little secret. I mean really, the books are silly. I wouldn't go as far as to say dumb, but this is TRUE beach reading, fluffy stuff that is all entertainment and not a lot of thinking involved. I'm almost torn as how to even review it, because on one hand I was completely sucked in, but on the other I found myself very irritated at the main character, America Singer (her name even bugs me), and found myself wanting to roll my eyes and say "WHAT IS WRONG WITH YOU?!" more times than I can count. However, even though I find America irritating, The Selection is a good story, and if you're in the market for a light-hearted, easy read that will absolutely engage you, then go for it. I really did enjoy all three books, beginning to end. But if you are someone who would probably tease me for still kind of liking The Bachelor and is a little more cynical of silly romance story lines, these might not be for you. But really, for $2.99 it's worth a shot- maybe you'll end up liking the silly fluffiness of it all. I know my sister and I did! I seriously love some dystopian YA that is light and fun to read. I just blogged about my love for the Knife of Never Letting Go series. I will have to add this to my list; thanks for the recommendation! I am so with you! I saw this on your list of summer reads and I read the first book so fast and then "splurged" on the other two and got through them fast two. I just thought she was a little thick but they were definitely enjoyable books and while I think the end was a little rushed in clean up of loose ends, I did still like it. Totally. More to love than hate, for sure! Yay! This was such a fun trilogy! I love when I find a series that I can't put down and that was definitely the case with these books. Hunger Games meets The Bachelor is such a perfect description, ha! I read these books in three days and it was SUCH a love/hate experience. I became so frustrated with America but, like you, I couldn't put the book down! So crazy what a love/hate relationship it was! Now I'm curious about the novellas that tie in with the books! I was in the same boat with these books, loved the fluffy easy read, but omg its really superficial and kinda ridiculous...but guilty of reading them all in succession as fast as I could cuz it was still just fun. I've been meaning to pick these up! Thanks for the reminder. Hopefully they'll translate well to audiobooks, since that's how I'm able to consume most of my books nowadays. I read this series and I completely agree with you. it's serious fluff I got so angry with America so many times. You should check out the Grisha trilogy (not really dystopian but just amazing) or the matched trilogy. Also I don't know if you mentioned it before but, do you have a goodreads account? This has to be the best piece of baby gear I've seen. Great design, easy to use and great for travel. I'd love to win one so my first little squish will have a cozy place to sleep and a great place to play! I am so addicted to these books! I've already read them and want to reread! Love them! This might be just the thing I need to get me through the remaining week of pregnancy. Although I went to graduate school for English literature, I loved The Hunger Games series, and sometimes it's really nice to read a page-turner, especially during the summers when I'm not dealing with literature on a daily basis. Thanks for the recommendation!